There are potentially many activities involved in the full lifecycle of an OO System. Some people will start with an Analysis Model, which describes 'the problem'. From this, they will create a Design Model, which describes 'the solution', and then go on to develop from that design, with changes made as the implementation and the local change control system require. Finally, there will be the Implementation model of the system as developed - which hopefully is pretty close to the Design model. All these models will probably use UML and have some number of backing documents. In this process the Models are usually more or less inviolate: they may change, but only with great effort and reluctance. Another approach is to skip the Analysis Model and go straight to the Design Model. This model provides a start for development but is viewed very much as a perishable entity: it is valid for about one hour after it's finished and must then be viewed (if kept at all) with suspicion. This is much closer to my view of Models: they communicate something which is valid now and as we all know better ideas come along later, or constraints we hadn't thought of appear, or the user changes his mind about something. One thing I do like to do, though, is to create a fairly high-level model at the start. This will show me the major areas that I'm going to have to implement at the very least. I am likely to go through several iterations to get to a model I am happy with. As I get more experienced, or know more about the problem domain, this initial model looks more and more like the final implementation - as long as the user doesn't stick his oar in! The purpose of this exercise is to take some requirements and produce this initial model. Next, look through this list and remove items that are unnecessary (redundant or irrelevant), or incorrect (too vague, or they represent things outside the scope of the model, or they actually represent actions). The system will record animals, their names and owner's names, and the results of genetic tests made on animals. These results come in the form of a 5-character string describing the expression of an allele for each allele tested; there will be 5 or 6 alleles per animal. A technician will be able to call up the results for one animal and ask the system to match its test results, via an algorithm to be supplied, against other results in the database and display the matching animals and their test results. The technician will then select from this list animals which are, by his interpretation of the tests, related to the original animal. This relationship will be stored for later enquiries. Database should be eliminated. We may end up with a database class encapsulating some form of storage, but right now it's too nebulous to be a class. List is either a GUI object - thus irrelevant at the moment - or a collection of animals, and so can be excluded either way. Technician is an Actor and so may appear on use case diagrams, but does not, so far, merit being a class. Algorithm is pretty nebulous: it's going to have to be expanded on but it will definitely be there; it stays. 5-character string is the same as expression and so we'll drop it as expression is a more descriptive word. Name and Owner are clearly attributes of an animal. It's important not to spend too long on this activity, otherwise you'll get bogged down in analysis-paralysis. Once you're read and assimilated the requirements document I would guess half a day to a day to get to this point is enough on all but huge projects. We aren't trying to get every class, just the most important ones from which the others will appear as we get into more detailed analysis. By the time you've assimilated the results you possibly have an idea of the broad shape of the system anyway; I usually skip this step as I've effectively done it in my head, and go straight on to the next. This is where you write out the relationships between the classes you've discovered. I start by showing the connections between the classes and their cardinality: for instance, one Animal will have 0 or many GeneticTests (the requirements at this stage don't say anything about this, so I'll assume what seems likely to me and clear it up later). 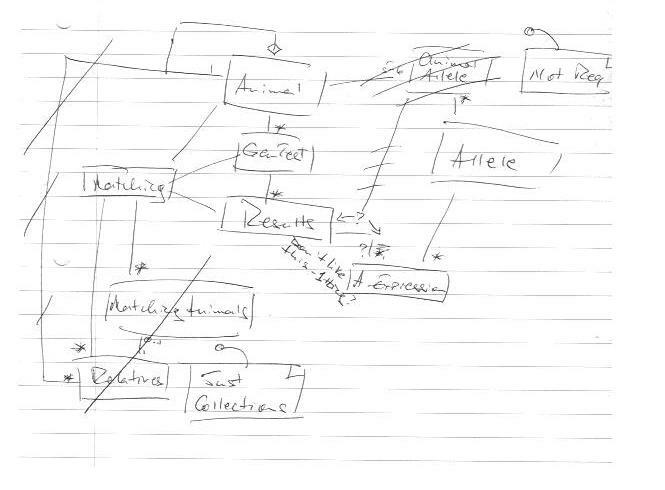 One important thing to note is that this diagram does not include the RelatedAnimal class but does have a relationship from Animal to itself. This is the 'Open Diamond' relationship, indicating that one animal may have a relationship to many Animals. I have labelled this 'isRelatedTo'. This self-relationship does away with the RelatedAnimal class for the moment: all we know about the relationship is that it exists; we don't have any more information about it to store (e.g. what the relationship actually is such as 'mother' and so on) and so it's redundant. TestResult and AlleleExpression have a 1:1 relationship. Are they actually the same thing? I suspect that they are, and without further information would merge them. 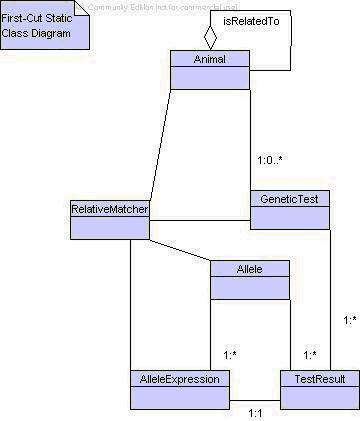 RelativeMatcher is linked to every class, given that TestResult and AlleleExpression are the same. (I haven't bothered to put cardinalities in.) This is worrying: it's starting to look like a God-object. When we get the details of the algorithm we may be able to split this up a bit. It's something to keep an eye on. 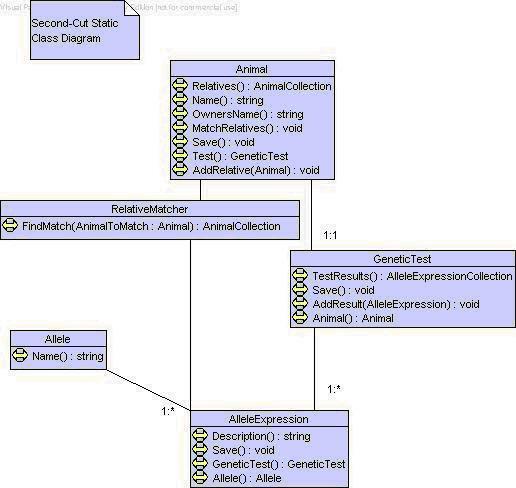 This diagram would also show any generalisation (inheritance) relationships I can find. Since I can't find any, I show none. The cardinalities I have put in are guesses. In this simple example I am fairly sure of them, but in a larger system I might not be. They can be missed entirely, but I find them useful. In any case, don't spend a lot of time on them at this stage. Another thing to look out for is Many-Many relationships: These can often cause problems which can be solved with the addition of an 'Association' class. For example, a contractor can work for many companies, and a company can have many contractors. Introduce an Association class called Contract which has one Company and one Contractor. Do this now if you are sure of the cardinalities. This is similar, though not identical, to a list in Use Case Driven Object Modeling with UML by Doug Rosenberg and Kendall Scott. The differences exist because the list is, after all, my mistakes. 6: Don't use hard-to-understand names for classes. For example, AlleleExpression is preferred to FiveOrSixCharacterString. Obvious, but very important. Always use Intention-revealing names even if they're long! 5: Don't go directly to implementation constructs such as namespaces, or public or internal modifiers. 4: Don't create a one-one relationship between database tables and classes if one source of information is a legacy database. 3: Don't go for premature-patternisation, building cool constructs which may have little or no relationship to the eventual solution. For instance, I think that RelativeMatcher may end up as a Mediator with a Strategy. It's fine for me to think that (geeky daydreams - yes! ), but not for me to start planning it in any way (how many of your dreams do you act on?). 2: Don't get attached to your solution yet. 1: Don't truly believe a pixel of it! It's a snapshot of your thinking based on not enough information. It's a place to start from which you can find what really needs to be done (which may include starting from somewhere else entirely, if you can't get there from here). Looking at the final diagram below I've not done too badly against these rules. I've got too many cardinalities, true, but I don't trust them so it's OK really. Honest! The more important rules I think I've done OK on. One thing I'll mention here, and won't again, is that I always assign an OID to each object. This may be a GUID or an int assigned by an SQL Identity column (I'm using GUID more and more these days). Just assume that that every class has a read-only OID property. Similarly, I'm not assuming anything about a storage mechanism as yet. In fact, I'm ignoring it. Obviously there must be some way to get data into and out of storage but unless the specification explicitly states that something must be stored or loaded and it has 'interesting' properties I'm totally ignoring that problem. It's an implementation detail and I'm not worried about it for this iteration of the design. At this stage, I'm labelling attributes, properties, and methods as methods or properties almost arbitrarily. What they actually are is an implementation artefact. What we're doing is creating the high-level interface for each class, not a program spec. interpretation Out of scope This is an action the technician performs, not our system. The associations we have discovered also imply attributes and methods. Here we must pin down cardinality and navigability. Usually this will involve discussions with the client. These discussions are fed back into the first cut diagram as more data is discovered, and classes and associations are clarified. Possibly the most important thing is that it's a simpler design than the first cut! This may be due to some assumptions I have made, but is certainly affected by the fact that I have a clearer idea of the design. The second cut isn't always clearer than the first, but I quite enjoy it when it is. I am assuming Collection Classes exist, but have not included them explicitly. They are present as return types for methods. Animal.Relatives() replaces the self-association, although both are real. If the diagram wasn't showing the methods I would put the self-relation in. I am 50/50 on including it anyway. At the time of printing the diagram I left it out. Right now I think it should be in. The criterion for making the decision is: does it improve communication or is it unnecessary (in this context) detail? RelativeMatcher is still sketchy. It could be folded up as a method of Animal, but I assume that it's complicated enough that in the interests of clarity and maintainability it's better off in a separate class. This may go against YAGNI but in this case, I think I am (and YAGNI applies to implementation anyway). Right now, it's not worth any more thought; after all, 'to be supplied' could mean that the user's going to supply a COM object or something to do it for me! I have assumed that all associations are navigable both ways: a GeneticTest can give its AlleleExpressions, and each AlleleExpression can give the GeneticTest it's part of. The navigability will actually come out of the actual implementation: will the GUI ever need to navigate that way? I don't really know as yet. In busier diagrams I would leave most of these navigation methods out as being unnecessary detail. The ones I would probably leave are Animal.Test and GeneticTest.TestResults - the rest are probably clutter. I have assumed that an Allele has a name so that the technician entering the test results will have some way of identifying which AlleleExpression is which. Depending on the matching algorithm this may not be necessary. If it's not necessary then we probably don't need the Allele class. Animal Relationships - match and allow the user to select. Enquiry - to show an Animal's relationships. These may be cut up in different ways - they could all be in one screen, but for me it would be too busy and complicated. Anyway, this is what I'm going to propose to the user. Now it's time to have some discussions with the user to confirm my assumptions and suggestions - or otherwise.